A go variant I thought up (probably already exists, in which case please just link to the page in question). This was in an attempt to simply the rules. The whole ko-business is one of the most unattractive features of Go, I think. Esp. in Japanese and similarly complex rulesets. I think the superko rule is a very elegant solution, but what about eliminating even superko? 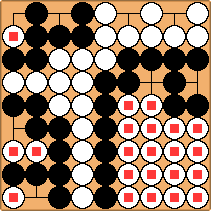 When a group's liberties is exhausted, that group just changes color (like in Othello/Reversi) instead of being taken off the board. Thus kos do not exist and there is no need for a superko-rule (or similar). Naturally, this variant would use area scoring (or just equate score with number of stones of your color). 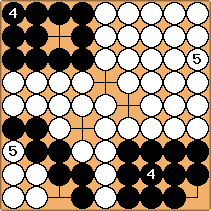 Superko or any similar rule is not needed because the number of stones on the board is strictly increasing (except for pass), so positions do not repeat themselves. This game seem to turn into an advanced form of Reversi. Suicide is not allowed: this is the variant I originally thought of and will discuss below. Color change: If a player fills the last liberty of an opposing group of connected stones, those stones change color. No suicide: A player may not play a stone such that, at the end of the move, after any color changes, it has no liberty. What are the effects of this rule change? If White moves first he can kill either of these four black groups by going at the marked points. Black could not play in the upper left so he was forced to pass as Black 4. If Black had played 4 at here, then it would be suicide which is not allowed. None of the dead-looking white stones can be captured, they all live in seki. Large and empty eye-spaces now also start to look very killable because capturing stones do not help form eyes (rather, it takes them away). Because of this, not getting surrounded would seem even more imperative than in normal Go. At the same time, actually capturing stones might be less attractive (unless as endgame play) because it does not form eyes, and thus capturing a stone solidly will not bring the strength to weak group that it once did. For example, the value of capturing a stone in a ponnuki is reduced. One interesting thing is that the empty triangle might have some value (or at least it might be more efficient than in regular Go), because it is more beneficial to get "solid" and square eyes, and not eyes made by diagonal connections. This reduces the White's group to one eye! Without ko the game should be easier for computers to handle. I haven't thought enough about this to develop higher level strategy, but it'd be interesting to see how opening theory would change. This game does not seem as deep as Go because all of the complexities involving kos are eliminated and life and death (esp. l&d in corners) is vastly simplified. So a special victory condition must be set, for example that if the entire board is filled with only one color then the player of that color wins. But I don't think this variant would be a very interesting to play and think about, so that's why I don't elaborate on it that much. This move wins the game for Black. It turns into this, which is (necessarily) a special exception from the "color-change on liberty exhaustion"-rule. However, White cannot kill all these groups. The top right corner stays Black, with no dame (! ), when Black captures with . The other corners become seki. fractic: I'm not sure I agree Bill. in the top right corner looks like suicide to me since the black group would have no liberties after the capture. Bill: Well, after in the top right corner is played, somebody's stones change color. 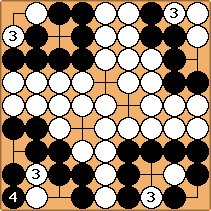 Since White is captured in regular go, I suppose that would be White' stones, not Black's. fractic: Now black captures white but ends up with a group withouth liberties so it would turn white again. But the group still doesn't have liberties so it would turn around again and again. So there has to be some rule about this. Bill: Indeed. Perhaps, as I thought, a stone may not be played that leaves itself with no dame unless it changes the color of an opponent's stone. And, as in reversi, stones may remain on the board even if they have no dame. Under this interpretation, captures the White stones, and wins by 9 points. OC, it is a new game, and I have no real preference between these differences. fractic: Moreover I think that the topleft can be killed since is a mistake. fractic: White gives atari in the top left and if black captures it ends in a kind of snapback. fractic: Looking at this again I think black can make seki if we allow captures leading to groups without liberties. fractic: If it would be allowed to capture stones and live without liberties then would lead to a seki. Other moves for would also lead to a seki but with less points for white. How do I indent diagrams? :) Just place > in front of all the lines? White plays in the eye and all the black stones are lost. 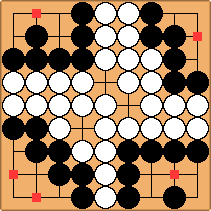 White can play this 2 because after black changes color, will be connected to the surrounding white group which has liberties (two eyes). fractic: Also the bottom two groups actually depends on whether moves like in the top right are allowed. If so then it's seki indeed. But if not white kills. fractic: After in the lower left black can't play at the cirle. In the lower right Black can't capture with so passes. After black wouldn't be allowed to play on the square. Bleedo: This is a very interesting Go variant, although I'd really be scared to play it. luigi87: A more interesting variant based on this idea is Steven Meyer's Conversion Go ( http://home.fuse.net/swmeyers/conversion.htm), in which a group of stones that touches at least two different sides of the board (corners belonging to sides) can't be captured, and so is alive. luigi87: I've just designed Loose, a significant improvement on Reversi Go. 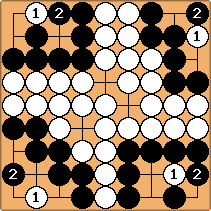 Another idea: in Reversi Go, it might be interesting to never allow to place a stone such that your own group has no liberties, even when it would capture other stones. Making life would be easier that way. Update: I've tried it. 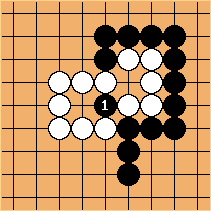 It's very similar to One-Eyed Go, but maybe slightly better because it gets rid of the slightest hint of a cycle. Making life is much easier than in Go.